Our firm has a long tradition of community involvement. We are proud to support our associates’ passion for service by matching individual donations, hosting workplace giving programs, backing deserving causes through Baird Foundation and supporting their individual volunteer efforts. 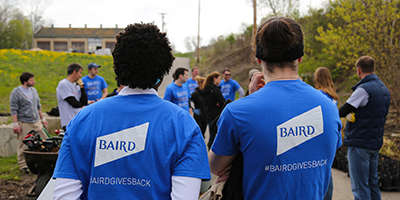 Many of our associates team up during Baird Gives Back Week, an associate-organized series of volunteering events in communities across the globe. Held annually since 2009, the event now unites more than 1,511 Baird associates, relatives and friends on three continents. Many of our associates joined their co-workers, relatives and friends to support deserving causes across the U.S., Europe and Asia. 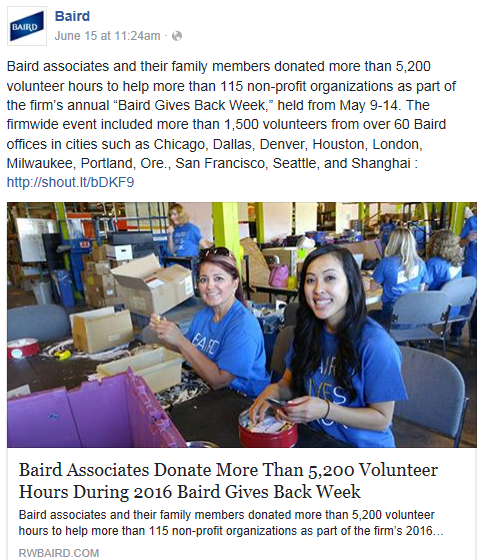 Baird volunteers gave generously of their time and talents during our 2016 event, which occurred over a six-day period in May. A host of organizations benefited from volunteers’ time and talents. 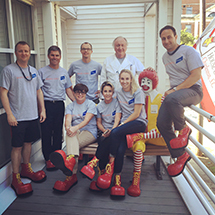 We encourage our associates to serve charities that are important to them. Baird offices across the U.S. – as well as our London and Shanghai offices – came together to give back to their communities. 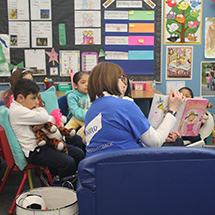 View photos from the 2016 Baird Gives Back Week.